Happy Friday Everyone! I hope that y’all have had a wonderful week and are looking forward to a beautiful weekend ahead! I am currently enjoying an almond milk latte and chia seed pudding at Panera while working on this blog post and preparing for a meeting with a health coaching client. I feel so fortunate that we have a Panera within walking distance of our house. Obviously, I could make my own coffee and do work at home, but I have found that getting out of the house is SO important these days. It’s so easy to fall into the rut of staying inside with a newborn, just because getting out of the house seems like too much of a hassle. But mentally, wow, I freaking NEED it. Even it it’s just for a few minutes, or a quick run to the store, it’s so important for us mamas to get out and have have a bit of normalcy – interacting with someone other than our little nuggets. Also not only for me, I believe it’s so important for her. Brian and I tried to take Delaney out and about from the start. Allowing for her to get used to being in different environments and feeling comfortable hearing different noises and experiencing different sights. I know it can be scary at first to do these things on your own with a newborn, but forcing yourself a little bit at a time gives you confidence to do a little more. Plus, I was pleasantly surprised to find out that Panera now serves almond milk. On to the weekend! We have a good mix of family time, house projects and a little relaxation on the schedule . I am super excited to be celebrating Brian’s first Father’s Day! Should be a pretty special day! But first we must get through Friday. And that may mean getting in a workout before the weekend officially hits, or maybe you put this one on the schedule for this weekend when you have a little time. As you may know, I am a huge fan of quick high intensity workouts. Most of my workouts last no longer than 20, maybe 30 minutes start to finish, and I really don’t really do very much running anymore. I am planning to run a race in October, so that will change. But for the past 4 years (since running my first marathon and suffering from a few injuries) I have focused on resistance training and yoga to allow for my body to get stronger and more mobile. What once was my primary mode of exercise was causing numerous aches and pains, and I have found that more strength training and short intense periods of work are not only ways more effective, but with Delaney, typically all the time that I have. That being said, even though HIIT is what typically makes up my workout regime, that doesn’t go to say that I don’t enjoy a good long sweat sesh on the treadmill from time to time. Thursday morning, Brian didn’t have to go into work until a bit later, so I programmed a treadmill interval routine and it felt so great to sweat and get my heart rate up! It includes a mix of running, walking and incline work to change things up as you move along. 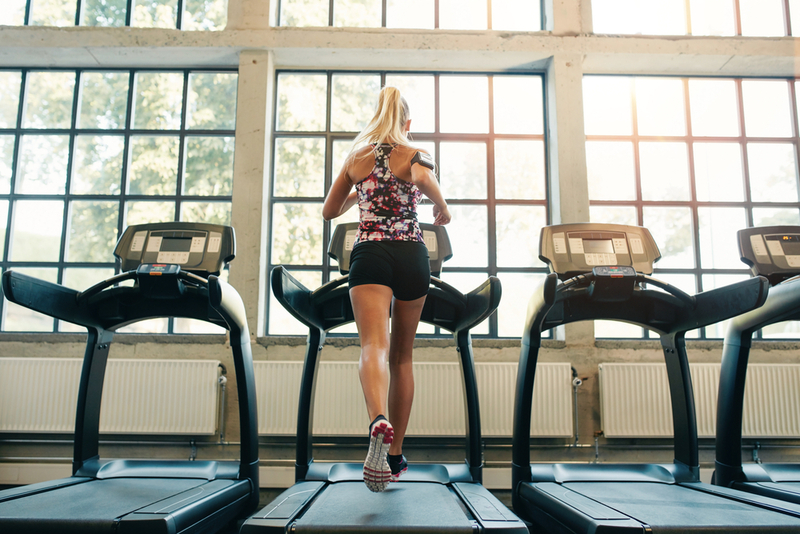 Workouts on the DREADmill can be monotonous and boring, so I find that mixing up the intensity every few minutes keeps you engaged and helps the time pass faster. I have given prescribed speeds and incline levels, but of course these can be adjusted to fit your fitness level! Give it a try and let me know how it goes!